KSIM (Rechargeable) : Passport or alien registration card is required. Available ONLY in Myeong-dong office. Please read the contents on this page carefully. Outgoing Call : ₩264 / 1min. Free calls with KT 100 min. 200 min. Passport or alien registration card is required. Unlocked SIM Free Smartphone ONLY ! Contact your telecom company to unlock. See the！NOTICE tab for more information. you can Rent or Buy it in Myeong-dong. Mobile authentication is available ONLY when you sign up with your alien registration card. Can NOT contract at the airport. Available ONLY pay by cash. After initial charge, validity period increases by 60 days per ₩10,000 of recharge amount. It can be used up to 2 years. the validity period expires, regardless of the original validity period. the remaining balance will be extinguished and will not be recoverable or refundable. Be careful that the balance does not become 0 & the validity period is not over. 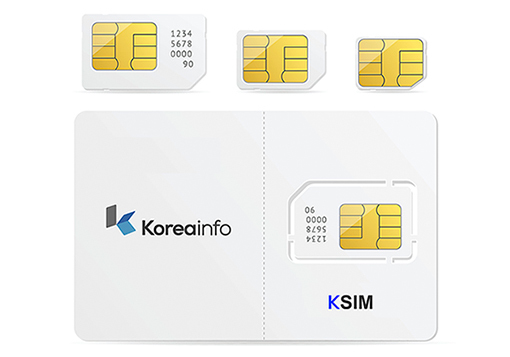 When the expiration date is over, KSIM will be terminated after 30 days. ② When you end a call after placing a call anywhere, the expiration date and the balance reminder text message is automatically received. Can be charged by credit card. Please go to KT Olleh Shop, show the sentence below to staff. KT 선불 사용중인데, 통화요금 충전하고 싶습니다. We do not ask questions about the contents on this page. During non-office hours, will be responded on the next business day. It may takes about 30 mins. Termination and plan change is available after 185 days from the date of opening. Mobile phone authentication is ONLY possible when you contract by alien registration card. You can use it when you purchase a Data Plus Service, and register the WiFi Address of your phone. KT 선불 사용중인데, LTE Simple 충전 데이터플러스에 가입하고 싶습니다. Olleh WiFi 사용위해, 맥주소 등록도 부탁드립니다. ①SIM Free device from purchase. ②Device that already confirmed unlock service by your telecom company. Device is locked by your telecom company. Device that do not support KSIM frequencies. Device that is registered by other SIM Card. Device that is stolen or lost in Korea. Please let us know the number you used before when you sign up. You can Rent or Buy it in Myeong-dong office. Device change is not permitted. After opening your contract, please do not change the SIM card to other devices. If you want it, please go to KT Olleh shop.